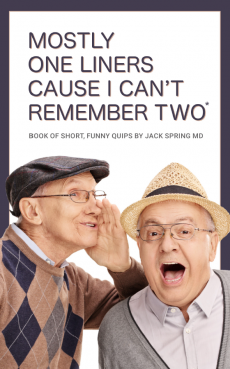 Jack is a retired orthopedic surgeon. He completed school and his surgical training by 1967 and served as an Air Force surgeon during the Vietnam war from 1967 to 1969 and then practiced his surgery in Schenectady New York for over 45 years. Donna and Jack have three daughters: Lisa, Jill and Heather and four grandchildren: Hanna, Johnny, Lilah and Jackson. Donna and Jack have been together forever or at least it seems that way. He has always had a great interest in music and says humor and music is his Prozac. Observational humor would be the words to describe the comedy Jack enjoys. Taking the ironic, absurd contradications of life and then finding laughter in the situation. It is certainly a very common problem as we march along in our senior years. Laughter heals the pain of life. Science has shown that the ability to laugh helps relieve stress, decreases pain, cope with depression and even improve your marriage. It can give us the mechanisms to deal with emotional trauma, defuse tense, anger situations and confront debilitating, even fatal illness. But moreover. its just fun to laugh.